Okay… so, this blog has been totally neglected for two whole years. I know… I know… it just seems like with Twitter/Facebook/Google+ handling the small stuff, and Techdirt handling a lot of the big stuff, I haven’t had as much need for a personal blog. Plus, somewhere, a little less than two years ago our son arrived… and (shocking, shockers) pretty much any and all spare time has switched over to spending time with him, which is all sorts of awesome, but means less time for random musings here on this blog. Actually, it’s meant no time at all for such musings. Anyway, I am still trying to figure out what to do with this blog, and I actually do have some ideas, which may involve some changes (finally), but in the short term, I did want to do a quick blog post about my sit/stand/elliptical desk, because I’d mentioned it on Twitter/Facebook and some folks have asked how it is… and I’d rather post it here than on Google+ where it might disappear. First off, some background, I actually did a bit of an experiment about six years ago with a “standup desk.” I honestly don’t know what compelled me to do this, but I just tried putting my laptop on some boxes on my desk, and I kind of liked it. But that lasted just a short while and I went back to good, old fashioned sitting. Still, a few months ago, I started thinking more seriously about it. I know that it’s become kind of an “in” thing, but I honestly didn’t quite realize that until I started to do some internet searches to see what might be available out there. I know a lot of people say that they do it because they have back problems, and I did have some back issues like five years ago, but nothing in years. I just thought that, in general it’s probably not that healthy to spend so much of my life sitting. Now here was the thing. Beyond just a standing desk, I was curious about the idea of a treadmill desk, because I thought it would also be nice to move a little during the day as well, beyond just designated “workout” times. But… I also wanted the flexibility of a sit/stand adjustable desk… in case I wanted to alternate between sitting and standing (or what happens if I break an ankle or who knows what?). 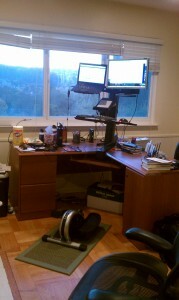 So, I faced a dilemma: how can I have a sit/stand/treadmill desk. And… keep it semi-affordable. This conundrum actually delayed the whole process for a while, as I read up on various options, and thought of ditching the whole treadmill option for a while. I read tons of reviews, asked questions on Twitter/Facebook/Google+. 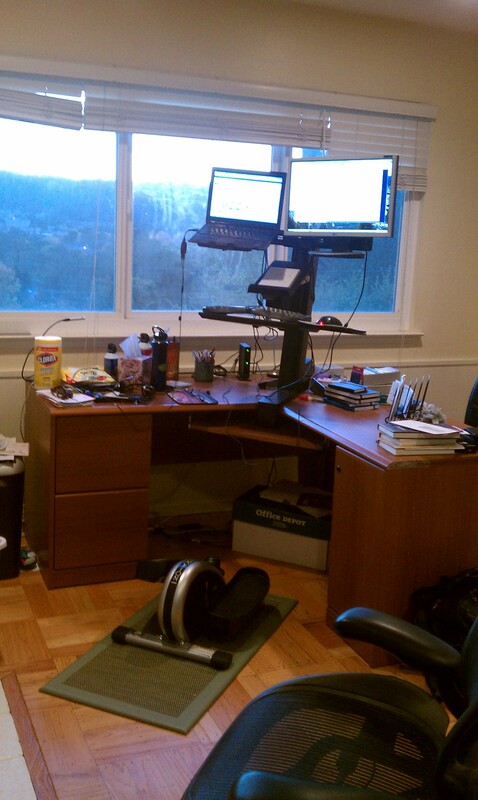 Read a bunch of Instructables pages about building your own treadmill desk… all of it. 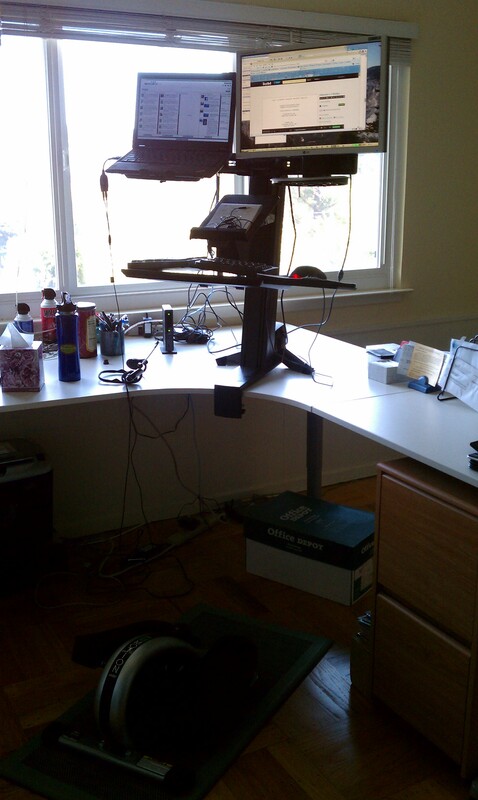 I realized two key things: (1) the really good sit/stand desks out there are crazy expensive. There are some cheap options, but the reviews aren’t great. (2) And there don’t appear to be any pre-made sit/stand/treadmill options that I could find, at least. The problem is the treadmill piece mainly. I really hoped there would be a good instructable on this, but even the instructables’ discussions on treadmill desks made them seem kinda flimsy. And then… two key breakthroughs. 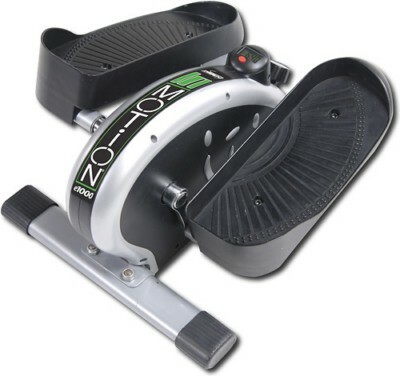 Breakthrough 1: wondering idly if there was such a thing as as mini elliptical machine without the arms. I honestly had no idea if such a thing existed, but two seconds of Googling “mini-elliptical” and I’d discovered the InMotion E1000 device. I originally saw it on the company’s own site, where they wanted $200 for it, but Amazon consistently has it for under $100 (sometimes significantly less than that). There are a few other similar mini-ellipticals, but this one seemed cheap and perfect for what I wanted. 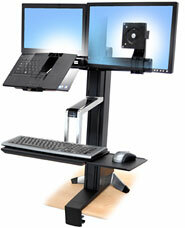 Breakthrough 2: Discovering the Ergotron Workfit S line of devices — and specifically the model that handles both a screen and a laptop next to each other — since that’s my basic setup. These are absolutely awesome products for effectively turning any table or desk into a sit/stand desk at much less than the cost of one of those desks. It may be difficult to tell from the image below, but that whole contraption slides up and down the post keeping the screen and the keyboard mouse tray perfectly ergonomically aligned. So I figured, with those two things, I could retrofit my existing desk, which I’ve had for over a dozen years, and make it a sit/stand/elliptical adjustable workstation. I’d just have to move the elliptical out of the way by hand when it wasn’t needed. And, amazingly, it worked! Mostly. And I actually used this setup for about a month, alternating between ellipticalling (is that a verb? ), standing and sitting. I actually got the hang of the basics pretty quickly, and within the first week, I was basically only sitting about an hour a day. However, I quickly discovered one key problem. The addition of the elliptical made me too tall. I had actually thought about this, but figured it was unlikely, since I’m pretty short already, and at most the elliptical might add six inches to my height — and I figured the Ergotron must be designed to work for people taller than that. Well, either it’s not, or my desk was really low. Whatever it was, even when the Ergotron was at its highest setting, if I was on the elliptical, it was just slightly too low. Just. You couldn’t exactly tell just by looking at it, but you could feel it. Especially if I was typing, I’d have to crouch just enough to make it work… and that was clearly uncomfortable. So, for about a month, I compensated by standing on the elliptical while reading, but as soon as I started typing, I’d step off the elliptical, lower the Ergotron a bit, and just be standing. For what it’s worth, after my feet started hurting and after seeing a recommendation on Twitter, I picked up a cheap anti-fatigue mat to stand on. This was… less than ideal. And… since then… wow. I cannot stress how awesome this setup is. The height is now perfect for the elliptical, and I will say that I have almost completely ditched the other two modes. I think that since Thanksgiving, I’ve probably sat on my chair for an hour or so (minus the fact that I sit in it each day to slip on some shoes to use on the elliptical). I’ve probably done a little bit of just normal standing work as well, but I’m probably 99% time on the elliptical as I work (and am there as I type this). Amusingly, my one other (minor) complaint with the old desk, was that since it was an L shaped desk and I liked having the set up at the corner point, I couldn’t actually slide the Ergotron all the way down when I was in the sitting position (the keyboard tray would hit the edges of the desk). However, with the new Ikea desk, while also an L shape, the inner curve is a gentle curve, rather than a sharp 90 degree angle, and that gives enough clearance that I can lower the tray all the way (though I do have to slide in the mouse tray, which is easy to do). But since I’ve more or less given up sitting, this isn’t even that big of a deal. The first few weeks definitely take some getting used to. The foot pain was definitely the hardest to deal with, but it gets better. These days, I don’t notice it at all. In fact, I kind of forgot about it entirely until writing this post. But getting the whole setup so that the height was right just made the whole thing feel… perfect. It feels like I should always have been working this way. Basically, the whole thing is just comfortable. It feels great. I definitely have more energy and even though I didn’t have any pain problems in the past… I just feel better. I just kind of get into a zone and go, all day, every day. Potential downside to elliptical as opposed to treadmill is that you’re responsible to keep it going. With a treadmill, you can set the device to move… and you better walk or you’re off the machine. That’s motivation! With the elliptical, you have to be disciplined enough to keep on ellipticalling. So far this hasn’t been an issue — though there are certainly times when I’ll start concentrating deeply on something and pause on the elliptical for a while. But, for the most part, I’m just going at a slow easy pace (except during the SOPA hearings… that had me speed up the pace out of annoyance and frustration with stupid Congressional reps). Breaking in the elliptical. About a week into using it, it started squeaking. That was a nuisance… and it lasted another week or so before disappearing. Since then it’s been quiet. However, on the right side, it has been “leaking” a fine black powder. I called the company behind the device, and they said that happens a lot during the break-in process and it’s not harmful at all. Just clean it up with a cloth and it’ll go away. Hopefully that’s the case. If I have to buy new mini-ellipticals every few months, that will make this a pricier option. The view! This is a bit tricky to explain, but my house is on a hill, and there’s a road that heads up the hill directly towards our house… before making a right turn to continue up the hill. Or, you go straight, and that’s our driveway (which also continues way up the hill). Then, my home office is on the second floor, overlooking the front of the house… and that whole hill and the road. When I was sitting, I just had a view of the valley and the hills across the way. When I’m standing (and standing on an elliptical) I have a full view of the the road leading up to the house. At first, it felt kind of… awkward. It’s tough to explain, but it had a “lording over all I see” sort of feel to it. Especially at night, it seemed like basically every car heading up the hill was pointing its headlights directly at me, and I wondered if they were trying to figure out why there was a strange man bouncing up and down behind some computer screens. Thankfully, the new desk is a bit wider, which puts me further back from the road, and it’s less of an issue now, though I do much more easily see when my wife gets home with our son each night, which is nice, so I can go greet them. The little details. I’ve had to rethink how I use the “desk space” now that most of it is a few feet below me. I did buy a little add-on for the Ergotron, which is a small platform that sits between the keyboard and the screens, which is perfect for a pad or a tablet computer (I switch back and forth). I also never removed the old desk stand from my LCD monitor before hooking it up to the Ergotron. I had intended to, but it actually acts as a nice ledge as well, and it’s where I store my phone when I’m working. The rest of the desk setup is a little more spread out (and I think I’m able to keep it more organized this way). I keep a water bottle within arms reach, and most other stuff is a bit further back. Water bottle. Huge. Never drank that much water while working before, but if you’re constantly moving, staying hydrated is useful. Shoes! We don’t wear shoes in our house, and I kind of like not wearing shoes, but the elliptical platform more or less requires shoes. It’s basically hard plastic, with a bunch of hard plastic lines jutting up. I’ve stood on it in socks or bare feet for maybe half an hour at a time, but it really gets to you after a certain point and it’s not that great. I’ve been considering buying another anti-fatigue mat, or some memory foam and cutting it into pieces that will go on the elliptical foot pedals, but for now I’ve just been using a pair of shoes. I’m actually using a pair of “negative heel” shoes that the wife bought for me years ago, which are easy to slip on and off, and are super, super comfortable, but which I rarely wore outside for a few reasons. First, they’re sort of a weird purple/blue, that doesn’t really match well with anything, and second is that the negative heel feels… a little awkward. But, on the elliptical, it just works. Don’t know why. So, these have become my elliptical shoes, and they just stay right next to the machine. I may need to buy more negative heel shoes in the future when these wear out. Noise and conference calls. I know that I’ve heard of people using treadmill desks using them during conference calls, but I’m more or less trying not to elliptical while on the phone. First, any sound of being out of breath would just be weird, even if it’s just a minor breathing issue. Second, I do worry about the noise from the elliptical. It is pretty quiet, but I asked some colleagues early on, and they could hear a quiet swishing sound if I was ellipticalling at full speed. So I generally do still stand on the elliptical while on the phone (or just pace around the office — something I’d always done in the past too), and maybe will do an occasional spin… but for the most part, I’m not ellipticalling while talking on the phone. Muscles and injuries. Definitely discovered muscles I didn’t know I had before. And there are days when I definitely feel sore. But that’s not too surprising. I’m a little more concerned about the possibility for injuries. There have been a couple of points where my knee has complained, but after a few minor adjustments in the setup, that’s mostly gone away. I think if it’s slightly off, it can have an impact, so I’m trying to be careful there. Going backwards. One thing about an elliptical: you can go “backwards” or “forwards” and I’ve had a few people tell me that they get confused on the machines and don’t even know which is which. In the past, when I’ve used ellipticals in gyms, I’ve always used them only going forward. However, and I have no clue why… for this setup, I almost exclusively use it going backwards. For whatever reason, that’s just significantly more comfortable. I don’t know why. Every time I switch and go “forward” it just feels wrong. I know that one of the advantages of an elliptical is supposedly that each direction works different muscles, so perhaps I’ll start to experiment in forcing myself to go “forward” more often to see how well that works. But, for now, it’s all backwards. I think that’s about it. All in all, it’s truly awesome. It’s a fantastic setup and I really should have done it earlier. I’m actually kind of wondering how I’m going to feel when I’m away from all of this. Unfortunately, much of January is going to be spent on the road for me, meaning far away from the elliptical desk. And I’m not sure what that’s going to feel like… Probably won’t be a big deal, but we shall see… Also, this is my home office setup. We do have a real “office,” but by tradition most of us don’t commute in to work that often. I’m usually there once (maybe twice) a week, which isn’t enough time to mimic this setup there. Though, one week I really felt the need to stand and ended up perching my laptop on a filing cabinet rather than sitting at my desk. If I end up in the office more often, I may at least have to pick up another mini elliptical. Unfortunately, they don’t look like they travel well… It may be mini, but it’s hardly portable. Either way, it’s been great. For those who are thinking of such things, I recommend testing it out. Hmm. A fair bit of travel, and definitely a bunch of international travel. Shorter than last year’s list, but that’s because last year included a nice road trip. This year has already started off with a bang, but is going to be a much lighter travel year overall (very much on purpose). Five years ago, one of my college roommates was getting married in Miami, and with my grandparents (at the time) living just a bit north of there, it became an opportunity to visit them and (more importantly) to introduce them to Sunnia for the first time. She was nervous, and even I was a bit nervous, though I knew my grandparents would make her feel right at home. They did much more than that. My grandmother and my (future) wife bonded immediately. Despite there being nearly 60 years difference in age, being born on different continents, having different native languages and cultural backgrounds, the two of them bonded as if they had known each other forever (much to my own detriment at times). The two of them both have a mischievous joking side, and they would kid each other — and (more frequently) team up to make fun of me together. Two and half years ago, I was thrilled that my Grandma Rose (with Grandpa Sid) was able to fly out to California for our wedding. You could see how thrilled (of course) she was to share that experience with us. Two and half weeks ago, my travels took me to New York on my way to Europe for work, and I was able to stop by and visit them (since they had moved back to New York from Florida a few years ago). My friend Yuval picked me up from the airport and we drove up to Queens. Grandma was (as always) happy to see me, and thrilled to play host. She caught us up on family stuff and then spent time showing Yuval around the apartment, including scrapbooks of all my grandfather’s crafts and her own needlepoints. Then she gave us a tour of “the museum” as she called it — having put up a bunch of her old photos — including photos of her own (and my grandfather’s) grandparents. She was her usual self, and what I remember most was her laughing and joking about the way Sunnia had informed Grandma of her pregnancy — doing a pitch-perfect mimic of Sunnia’s joking phone call and then roaring with laughter about how amusing it was. Later my sister Amy and my cousins Jenny and Jason along with their kids came by and we had a really wonderful time. Two days ago my Grandma Rose passed away. It was her 69th wedding anniversary. I’m typing this at 33,000 feet flying over Utah on my way to New York, having just returned from there a week ago. What had been planned as a quiet four day weekend with Sunnia has now turned into an unfortunate rushed return to New York for a funeral. Amazingly, despite the Thanksgiving weekend, we were able to get flights (and not even middle seats — though Sunnia’s sitting 13 rows behind me right now, and we’re returning on different flights). A year and a half ago, for her 90th birthday, the six cousins who made up Grandma Rose’s grandchildren all told stories about her. I posted mine here. What became clear (even though we all knew it already) was that the biggest thing that came through in every story, was about her love of her family and her ability to keep us all together and as a close knit group, even as we all lived our own lives in different places around the country. Seeing as it’s Thanksgiving, it seems only appropriate to give thanks for everything that Grandma Rose gave to us as a family over the years, through mostly good times and the occasional bad times. From being able to raise her three daughters, including my mom and her twin sister while my Grandfather was off fighting a war to passing on (not always wanted or appreciated) advice and wisdom to all her children, children-in-law, grandchildren and now great grandchildren, Grandma was always at her best being the glue that held the family together. Grandma taught us all a lot about love and the importance of family — and while there’s plenty to be sad about today, there’s so much to be thankful for as well, for all that she gave to her family and shared with us over the years. Well over a year ago, I wrote about just how useful Twitter can be, and over time that’s only increased. I have to admit that until about a month ago, I mostly just used Twitter in the web interface. I did install Digsby as a client, but I basically just used that to notify me when new Twitter messages were showing up. But then I kept hearing about neat things (such as groups) that TweetDeck allowed, and I started playing with that. It took some getting used to, but there were definite advantages. Being able to set up groups/columns/persistent searches and laying it out in a nice format actually made Twitter that much more useful. It became, as I noted in a Tweet sort of a “personal Bloomerg” for me. But still… Tweetdeck had limitations. While you could edit the colors (useful! white text on black background is awful for eye strain), there were limitations. Then, I noticed that Tweetdeck was dropping a bunch of messages. I’d only noticed because people would tweet something in reference to an earlier tweet… but that earlier tweet wouldn’t be there. In the past few days it’s only gotten worse. I asked for some suggestions for other apps and have now tested out both Seesmic Desktop and Destroy Twitter. Both have some nice features… and others that are quite annoying. People recommended both Tweetie and Nambu… but both are only available on Macs, so I couldn’t test them out. Customization! Let me choose colors/fonts/sizes. Tiny white text on a black background? Sorry. Unusable. Let me manage how many columns/groups I want. When you limit what I can do, it just makes me want to look for other apps. Tweetdeck seems to limit you to 10 columns. Not sure about Seesmic. Destroy Twitter has 6 total columns (home/replies/direct messages/groups/search/saved tweets), and only displays three at a time (first three or last three). You can do multiple groups/searches, but you can only see one at a time. That gets annoying. My screen can show more, so let me see more. And making me manually switch between groups or searches? Why? Just show them all. Also, we don’t necessarily need the full column metaphor. Why not set it up as a canvas and let me organize each option as I see fit? Then I can set it up exactly as I want. My full stream can be a full column, but I don’t get many direct messages. So maybe I only want direct messages to be a small box in the corner, and then I can put a lower volume persistent search beneath it. Let me organize how I see everything on an open canvas and I’d be much happier. Make it easy to set up groups — which means setting up multiple ways to manage groups. Tweetdeck gives you a list of everyone you follow. That works well until you have a ton of users you follow. Seesmic only lets you add if you see people in your home timeline. That’s awful. I purposely set up groups so I make sure I can see important messages from people who don’t tweet often, but I don’t want to miss (like my mom or my wife). Destroy Twitter shows you the first 4 (alphabetical) people you follow and then offers a search box. Showing those first four users is useless and if I don’t remember the usernames, the search is useless. Why not set up a combo of all of these? Show the list. Let people add from their stream. And offer search. Notifications: Tweetdeck and Seesmic just tell me I have new messages (and in what buckets) but don’t display the messages themselves. Destroy Twitter and Digsby at least show actual text in the notification… except both just show the latest message (Digsby lets you scroll to the “next” message if you get your mouse over the notification fast enough). I would kind of like to see all the incoming messages displayed briefly. That helps with the whole “ambient information” concept. Facebook integration is definitely nice — props to Tweetdeck and Seesmic for doing that… but why won’t either let me clear out those messages once seen? I can clear out Twitter messages, but not Facebook messages. Server integration. If I run the client on multiple machines, it should know what I’ve read/not read. Better handling of read/unread messages: make it easy to mark stuff as read and clear it out…. and then if I *do* want to go back, make that easy too. Tweetdeck lets me clear out read messages, but if I shut it down and reopen… they’re back. But if I don’t shut it down and reopen, there appears to be no way to get my “cleared” messages back. If I want to see them again, I have to either shut down/reopen or go to the web interface. Maybe just do what Gmail does and have an “archived” box/column that can be opened. Show me all my messages. Not sure if this is an API limitation or what… but if I shut down for the night and open up Tweetdeck in the morning, it only shows me a few hours worth of messages. I’d like to see everything since I last logged in. At the very least, make this a user option… (related to this: Tweetdeck, STOP dropping messages). I think that’s it for now… though I may have some other thoughts later. What other features would be good? Red Soul Community — Hey Hey Uh!